We go through a lot of fruit in this house. All that tends to be left in the fruit bowl by the end of the week is the odd item that is slightly bruised and the kids were too lazy to cut the bruise out of and eat. 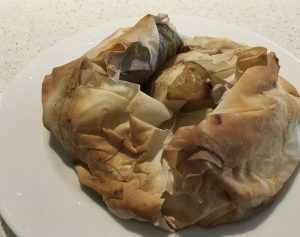 This week I had 2 apples, 2 pears, 2 nashi and 4 sheets of filo pastry that needed to be used up. I also had a bottle of quite revolting, sickly sweet non-alcoholic shiraz that I bought by mistake and could not possibly drink. A small adaptation of a Donna Hay recipe I read at the hairdressers inspired this dessert. Place fruit in a baking tray. Sprinkle wine over then thyme leaves and sugar. Wipe some vanilla seeds from the pod on to each slice. Roast at 180 for 1 hour. Toss through liquid half way. Leave to cool. When fruit is cool, lay out each sheet of filo and fold in half. Place 1/4 of the fruit in the centre of each sheet of filo ensuring that you get a good mix of fruit in each tart. Gather the sides of the pastry roughly up the sides of the fruit. Brush the outside of the pastry with the orange juice. Bake at 180 for 2o – 30 minutes until the pastry is golden. Can be served with cream, ice cream or custard.